So thanks to Slashdot this evening I became aware of a leap second bug in the kernel: Crash Info here. I have since implemented a newer kernel release (thanks to Debian Backports) we went from 2.6.26-2-amd64 to 3.2.0-0.bpo.2-amd64. I would declare this currently a testing install (haven’t set this kernel to the default boot kernel yet). I have also disabled NTP for the time being until tomorrow to make sure we don’t have a kernel panic. If you notice the server go down at all please rest assured that I’m working on it and will have it back up quickly. The tech finally finished work on our DSL. He had to change our physical phone connection three times to an unused line on the pole. As far as reliability is concerned it “should” be better than what we have been going through. Some time this month we will be moving server locations and possibly a different carrier. More info will be provided once we figure out which one to go with. Sorry for the downtime folks but sadly these things happen on occasion. So you have probably noticed that Inexistence has been going up and down like a yo-yo lately. I’ve been posting notices on our Facebook, Google+, and my Twitter feed about it but I can finally post here. It’s not the server it’s the internet connection. We have a Cincinnati Bell technician coming out today (01/09/2012) at 9 AM between 12 and 4 PM to try and fix the issue. Be prepared for some downtime while they scratch their head attempting to fix it. Keep your fingers crossed that they can. 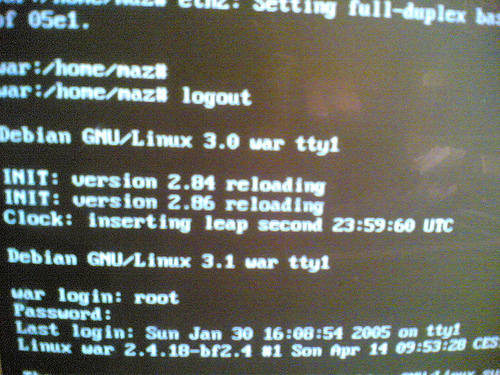 So I downgraded from the svn version of z-push 2 alpha to the stable z-push 1.5.6-954. So if you’re using push services you will probably have to once again re-add the exchange account. I also did a svn pull of round cube tonight. pure-ftpd got an upgrade tonight as well. Additionally I got to update my iPhone and push notifications still work yippee! So late last night we had a storm of epic proportions which caused quite a bit of flooding to occur. While the server is fine it fried our network router / switch entirely. I brought over my secondary repeating router to fill in the service gap for now. We really need to get / replace the current router with a different one as this is only a stopgap solution. any amount to help fix this massive issue.